Plus, take an additional 10% off sitewide! Strike-through prices not eligible. Use code EASTER at checkout. Ships: same day (up to 3pm EST) When will this item arrive? Known worldwide as the premier manufacturer of classic board games, Silverman & Co. continues the tradition of excellence with their new collection of Double 9 domino sets. Take a closer look at this thrilling combination of quality materials and craftsmanship, at an unbeatable price! 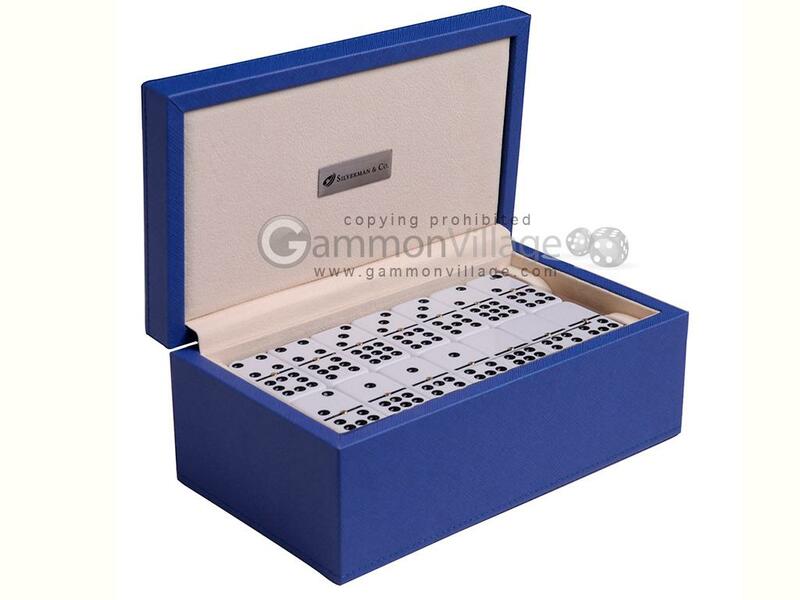 This Double 9 set of dominoes comes in a blue leatherette case, and contains 55 white dominoes with spinners. If you’re looking for large “bones”, these dominoes offer exactly that and so much more. Each domino measures a hefty 2-3/16” tall, by 1-1/16” wide, and a full 1/2” thick. In addition to their great size, these dominoes feature a smooth and polished surface, the result of using high quality polishing agents imported directly from Japan. The results are simply spectacular! Dominoes this beautiful require more than an ordinary storage box. Silverman & Co. have crafted a one-of-a-kind jewelry style storage box that not only looks stunning, it actually is designed to keep these dominoes well protected after game play. As seen in the photos above, each layer of dominoes is divided by a thick and smooth felt separator for added reassurance. When you first open the case lid, you’ll notice that the dominoes are covered with a felt insert, easily removed with a classy satin pull tab. The case lid is also padded, and is secured with hidden magnets when closed. Such quality craftsmanship and attention to detail are not found in any other product. Available exclusively from GammonVillage, the Silverman & Co. dominoes sets are ideal gifts when you need to impress, or if you simply need to have the best for yourself. Domino Size: 2 3/16" x 1 1/16" x 1/2"
Case Size: 9 1/2" x 5 1/2" x 4"
We offer FREE ground shipping to the contiguous USA and Canada (Hawaii and Alaska are excluded) for many products. Look for the "FREE SHIPPING" designation. For same day shipping, where indicated, orders must be received before 2pm Eastern Time (New York) in order to ship same day. Orders received after 2pm will be sent out the following business day. Orders received on weekends and on holidays will be processed the next business day. We offer shipping to over 190 countries with United States Postal Service using Express Mail	International. Packages are insured and fully trackable. Unfortunately, we cannot supply tracking numbers for shipments to APO/FPO addresses. The U.S. Government	requires that we send all shipments to APO/FPO addresses using the U.S. Postal Service. When completing your Shipping Address during checkout, please make note of the following. * The Country must be "USA"
* The City must be entered as either "APO" or "FPO"
* The State must be selected as either "APO/FPO AA" "APO/FPO AE" or "APO/FPO AP"
* Always remember to enter your full name, grade, and PSC or unit number. If you have any questions, please email us at sales@gammonvillage.com, or call us toll free in USA & Canada at 1- 866-260-2058. 1 Shipping charges at all times are based on weight and not on ticket price. There is a minimum 1-pound shipping charge on any item, including small items such as dice or checkers. In these cases, shipping charges can exceed the cost of the item. 2 We offer Express Shipping options on all items except Hillsdale game tables. All Hillsdale game tables ship ground freight. This code is required to prevent automated bots from using this feature. We have hundreds of top quality products at unbeatable prices from around the world. Buy backgammon sets, mahjong sets, chess, dominoes or other board games from our online store. Satisfaction guaranteed! Page P4870 Copyright © 1999-2019 GammonVillage Inc., USA. All rights reserved.